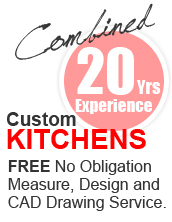 Custom Kitchens Noosa pride themselves on their innovative approach to kitchen, bathroom and furniture design. It's their motivation and commitment to manufacturing a quality product that sets them aside from the rest. Their modern approach to offering a Project Management Service from design to completion allows the customer to be at ease that their new renovation will be completed to a high standard with little or no disruption. Custom Kitchens Noosa services the whole of the Sunshine Coast. This has given Custom Kitchens a commercial edge that enables us to take on the responsibility of planning, organising, controlling and coordinating all of the trades on all aspects of a project, including painting and decorating, services trades and any additional building and/or renovation works, etc. Specialising in kitchens, bathrooms, wardrobes and fine custom furniture, Custom Kitchens Noosa ensure they use only the highest quality materials and hardware for the construction of your new space. With constant review of what is offered to the market Custom Kitchens Noosa will confidently offer the best there is available and source the finest of products including kitchen appliances and/or speciality kitchen and bathroom additions. With 20 years industry exposure we can offer a personalised experience that will be relaxed and friendly and guide you on a journey to your new and improved design of your dreams. With an obligation free quote, you will be able to see your ideas come to life with our 3D computer generated CAD design - enabling you to have a sense of ownership and understanding before your kitchen or bathroom is manufactured. Whether it is modern, conservative or with European influence, Custom Kitchens Noosa can tailor your ideas to produce a creation of your choice. We understand and appreciate each renovation or new build is different and with our meticulous attention to detail and skilled tradesman we can make this process seem effortless with limited fuss. As the benchmark in sophisticated design and manufacture Custom Kitchens Noosa can ensure this dream space comes true and will suit every budget without compromising the end result. EXCITING NEW SHOWROOM COMING SOON! !